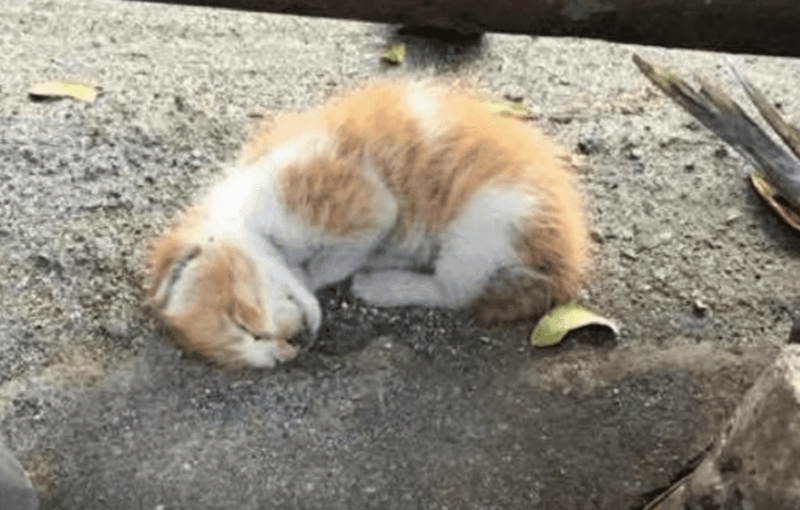 This cat was found by the roadside by two good Samaritans besides an automobile shop in the Philippines and was taken to be dead as he was so still and looked lifeless; bugs and ants were even seen to be crawling over his tiny body. It was later they saw movement in his legs that gave them hopes of him being alive. He was a very pitiful sight to behold; it was very evident that he was urgently in need of a whole lot of medical attention. The good Samaritans took the cat to an animal hospital so he could get the help he needed. How nice of them! At the clinic, they named him Alden, cleaned him up, gave him antibiotics for the infection, enough milk and water as he was very dehydrated and after a short while and with adequate care and medical attention, his eyelids opened to reveal a set of beautiful eyes, he was also able to walk without limping. Alden has been adopted and he is recovering perfectly, he has a healthy appetite and is looking perfectly fine and in good health. Watch the amazing video below!! !